Names matter. Geneticists have long told us that all humans form part of one big human race.1 Indeed, we share biological characteristics not only with one another but also with a surprising number of other species.2 Nature is versatile in its ability to try many elegant variations within the common building blocks of life. As a result, the old view, that there were many separate human species, which were incapable of inter-marrying and inter-breeding, has gone. So we should not still talk or think in terms of there being different races of humans. It’s simply not true. Continuing to talk that way is like talking of the flat earth or insisting that the moon is made of blue cheese. It therefore follows that we should not describe individuals as being of ‘mixed race’. The phrase is not only scientifically erroneous but positively misleading. It is a hangover from older ideas. Some early global explorers were impressed by our common humanity. Others, in good faith, saw different races. But the latter group proved to be wrong. Hence the logic is clear. Since there are no separate races, individuals cannot be mixtures of separate races. We are all one people. 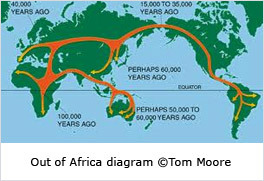 All ultimately in the human diaspora ‘out of Africa’. Nonetheless, there are different heritages and variegated group experiences within one common human history. How can we talk of those? One possible way is to refer to different ‘peoples’ within one species. But that terminology easily becomes confusing. Another old vocabulary talked of different ‘tribes’. Yet that too is unhelpful. If ‘peoples’ seem too nebulous and vague, then ‘tribes’ seem too small and sectarian. And in neither case is it easy to talk about compound heritages, whether from ‘mixed tribes’ or ‘mixed peoples’. Estimates of the number of different human ‘races’ can be found from as low as two (‘black’ and ‘white’) to as high as 63. Such a range of guesstimates indicates not just that the task was hard but that it was impossible. For example, the many subtle variations in the handsome spectrum of human skin colours, from lily to ebony, make drawing up hard-and-fast divisions based upon colour a subjective and fallible exercise. Interestingly, most of the proposed criteria for racial identification were solely external and ‘lookist’. But it’s hardly a secret that external appearance is no automatic guide to parentage. In countries where there were colour bars, plenty of people who were classified as black were able to ‘pass’ for white and vice versa.4 There are many permutations of looks and skin colour, even amongst very close family. Look around your own. Or consider some public examples. A current member of the British cabinet, the conservative politician Iain Duncan-Smith, has a Japanese great-grandmother. But you would not guess that he is one-eighth Japanese at a quick glance.5 Or take a different case: the twin British girls born to Kylee Hodgson and Remi Horder in 2005 have contrasting skin and eye colours, one being dark-skinned and brown-eyed, the other having light colouring and blue eyes.6 Their parents view them proudly as a genetic gift. But a stranger would not know that the girls are sisters – let alone twins – simply by looking at them. Does it matter? Not at all, for any human who accepts humanity as we are. It only matters for those who mind about such things, usually with hostile intent towards one or other of the attributed ‘racial’ categories. Indeed, some cultures do still maintain elaborate hierarchies of public status, tending to view those with light skin as ‘higher’ than those with darker hues.7 Such attitudes are, however, historic legacies of cultural classification that are not related to innate human qualities. For that reason, plenty of people reject a colourist world-view. The long history of caste fluidity and inter-caste marriage indicates that old cultural assumptions can be overcome – or shed entirely. At the same time, we do need to acknowledge variety in ancestry and ethnicity. There are some medical conditions that are associated with particular genetic clusters. So some form of reference is needed. In my view, the ‘lookist’ language of skin colour, though still widely used, is historically on the way out as a means of classification. It is too crude and, currently, too socially sensitive. We don’t now refer to ‘yellows’, ‘browns’ or ‘coloured’. And, in my view, references to ‘white’ and ‘black’ will also go the way of history. What then remains? The obvious forms of recognising difference relate to what we call ‘ethnicity’, pertaining to the many different human nations. That form of identification covers both biological and cultural affinities. So ‘ethnicity’ is not just a grand term for race. Instead, it’s an alternative way of recognising the effects of history and geography, by acknowledging the different cultures and traditions around the globe. 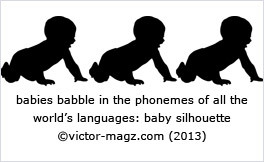 All human babies in their first year babble in the phonemes of all the thousands of human languages.9 Yet each child is brought up to speak predominantly in but one – or perhaps two – of those tongues.10 It’s a good example of difference within a common ability. ‘Ethnicity’ provides a neutral way of referring to variety within unity. It uses nationhood or world-region to provide a social label. Thus the ‘Japanese’ are those bred in Japan and who share the Japanese cultural identity – whatever their skin colour. Similarly, all the ‘Scots’ who will vote on the forthcoming referendum on the future of Scotland are those on the current Scottish electoral register, wherever they were born. Close neighbours, like my first cousin who self-identifies as ‘Scottish’ but lives in the north of England, will not. The great advantage of using national or regional labels is that they can be doubled, to acknowledge diversity of heritage. Thus John Archer, known as London’s first ‘black’ Mayor (Battersea: 1913-14) can be more properly described as a Briton, born in Liverpool, with Barbadian Irish ancestry. That pays due respect to both his parents. The Americans, as a ‘people’ with a long history of immigration, are paving the way in this usage, helping individuals to acknowledge their adherence to America but also a different parental heritage: African American, Irish American, Hungarian American, and so forth. But admittedly, there is one large complication when people have many ethnicities to acknowledge. John Archer, after all, was Barbadian Irish British. His wife was West Indian Canadian. But such convolutions can easily become cumbersome. What would their children be? Here the golfer Tiger Woods has found a witty answer. He’s pioneered the adjective ‘Cablinasian’ to name his Caucasian, Black, American Indian and Asian heritage. That should (even if it hasn’t yet) stop people trying to define him as ‘black’. Lastly, what to do when recent politics still governs the language of social description? It’s only recently that South Africa shed its tripartite classification of ‘white’, ‘black’ and ‘Cape coloured’ (difficult as it was to implement at the multiple margins). Now perhaps one might distinguish between people of Dutch South African descent or English South African heritage. But it would then be logical to talk about African South Africans; or, for mixed ancestries, (say) Dutch African South African. It’s all too much. How about following the people of Brazil, with their mixed heritage from indigenous Americans, Portuguese, Africans, and Asians? Their National Research by Household Sample (2008) classifies people partly by self-assigned colour and partly by family origin by world-region.11 For all other purposes, however, they are ethnic ‘Brazilians’. I guess that’s what Mandela would have wished to see happening among the next generations of South Africans. Down with skin-deepishness. Long live world-regional identities – plus their mixing. 1 L.L. and F. Cavalli-Sforza, The Great Human Diasporas: The History of Diversity and Evolution (New York, 1995): all humans should read this book. 3 For an attempted scientific methodology, see R.B. Dixon, The Racial History of Man (New York, 1923), pp. 8-45, 475-523. See also, for context, E. Barkan, The Retreat of Scientific Racism: Changing Concepts of Race in Britain and the United States between the World Wars (Cambridge, 1992). 4 The difficulty of classifying individuals objectively into clearly separate and unmixed ‘races’ has vitiated various past attempts at classifying racial intelligence – quite apart from the problem of finding tests that factor out the effects of different nurture and social/biological environment. 6 See report by Paul Harris and Lucy Laing, Daily Mail, 30 March 2012: www.dailymail.co.uk/news/article-2123050/Look-The-black-white-twins-turn-seven. 7 On pigmentary hierarchies, which are found in some but not all cultures, see D. Gabriel, Layers of Blackness: Colourism in the African Diaspora (London, 2007); E.N. Glenn (ed. ), Shades of Difference: Why Skin Color Matters (Stanford, Calif., 2009); S.B. Verma, ‘Obsession with Light Skin: Shedding Some Light upon the Use of Skin Lightening Products in India’, International Journal of Dermatology, 49 (2010), pp. 464ff. 8 N. Henry, Pearl’s Secret: A Black Man’s Search for his White Family (Berkeley, Calif., 2001). 9 D. Crystal (ed. ), The Cambridge Encyclopedia of Language (Cambridge, 1994), pp. 236-7. 10 Most children are monolingual, but bilingualism is not uncommon, where the parents have different languages, or where the wider society operates with more than one official language. It’s much rarer to be polyglot: see e.g. Xiao-Lei Wang, Growing Up with Three Languages: Birth to Eleven (Bristol, 2008). 11 Brazil’s National Research by Household Sample (2008) reported that 48.43% of the Brazilian population, when surveyed, described themselves as ‘white’; 43.80% as ‘brown’ (multi-ethnic); 6.84% as ‘black’; 0.58% as ‘Amerindian’ (officially known as ‘Indigenous’); while 0.07% (about 130,000 individuals) did not declare any additional identity. A year earlier, Brazil’s National Indian Foundation also reported the existence of at least 67 different ‘uncontacted’ tribes. See en.wikipedia.org/wiki/Brazil.